intended to affect the structure or any function of the body of man or other animals, and which does not achieve its primary intended purposes through chemical action within or on the body of man or other animals and which is not dependent upon being metabolized for the achievement of its primary intended purposes. The term ‘‘device’’ does not include software functions excluded pursuant to section 360j(o) of this title. What is an investigational medical device? (g) Investigational device means a device, including a transitional device, that is the object of an investigation. (h) Investigation means a clinical investigation or research involving one or more subjects to determine the safety or effectiveness of a device. (i) Investigator means an individual who actually conducts a clinical investigation, i.e., under whose immediate direction the test article is administered or dispensed to, or used involving, a subject, or, in the event of an investigation conducted by a team of individuals, is the responsible leader of that team. (p) Subject means a human who participates in an investigation, either as an individual on whom or on whose specimen an investigational device is used or as a control. A subject may be in normal health or may have a med- ical condition or disease. By applying the definitions (right), it becomes clear that simply using a device as part of a study does not make the device investigational. For example, if an non-invasive, unapproved device is used to make measurements as part of a study, but the study is not about the device, then the device is not an investigational device for the purposes of that study. For example, if an investigator wishes to use an unapproved device to measure cerebral blood flow but the study is not about the device (not assessing the safety or effectiveness of the device), then for that study, the unapproved device would not be investigational. Whereas the device would be an investigational device when used in a study designed to assess the feasibility and safety of making cerebral blood flow measurements during cardiac surgery. 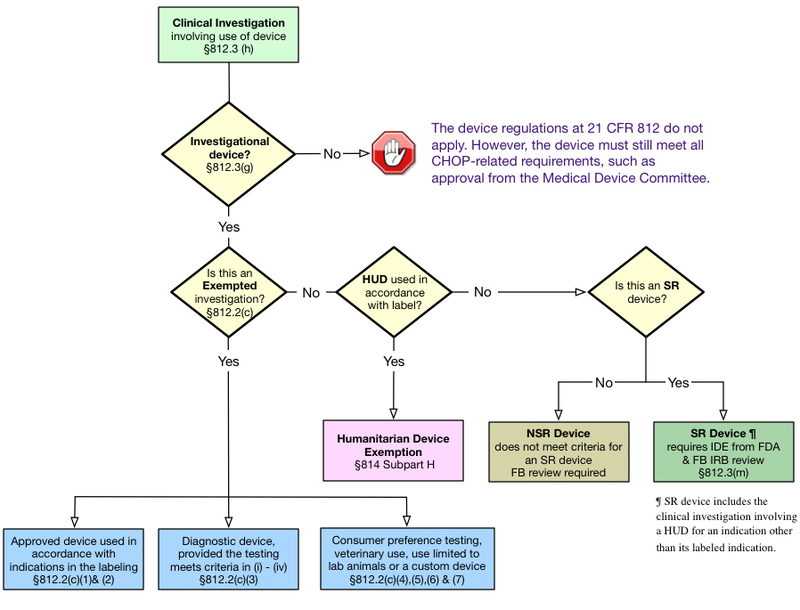 Following the flow diagram (below) and definitions on the Device Regulation and Classification page, the sponsor/investigator should first determine if the study meets the definition of a clinical investigation of an investigational device. If the study is a clinical investigation of an investigational device, then the investigator must determine how to apply the FDA's device regulations. The Investigational Device Exemptions (IDE) regulations (21 CFR 812) describe three types of device studies: (1) exempt investigations, (2) investigations of significant risk (SR) devices, and (3) investigations of nonsignificant risk (NSR) devices. The regulatory requirements vary, depending on which of the three types of device studies is involved. Humanitarian Use Devices, when used in accordance with their label - under a Humanitarian Device Exemption (HDE) - are a special case and follow different regulations. These are discussed on a separate page. With the exception of 21 CFR 812.119, the rest of the IDE regulations do not apply to device studies that meet the criteria for an exempted investigation under 21 CFR 812.2 (c). They also do not require the FDA, the sponsor, the investigator or the IRB to make an NSR or SR determination. A device, other than a transitional device, in commercial distribution immediately before May 28, 1976, when used or investigated in accordance with the indications in labeling in effect at that time. A device, other than a transitional device, introduced into commercial distribution on or after May 28, 1976, that FDA has determined to be substantially equivalent to a device in commercial distribution immediately before May 28, 1976, and that is used or investigated in accordance with the indications in the labeling FDA reviewed under subpart E of part 807 in determining substantial equivalence. Is not used as a diagnostic procedure without confirmation of the diagnosis by another, medically established diagnostic product or procedure. A device undergoing consumer preference testing, testing of a modification, or testing of a combination of devices if the device(s) are legally marketed device(s) (that is, the devices have an approved PMA, cleared Premarket Notification 510(k), or are exempt from 510(k)) AND if the testing is not for the purpose of determining safety or effectiveness and does not put subjects at risk. A device intended solely for veterinary use. A device shipped solely for research on or with laboratory animals and labeled in accordance with 812.5(c). A custom device as defined in 812.3(b), unless the device is being used to determine safety or effectiveness for commercial distribution. Otherwise presents a potential for serious risk to the health, safety, or welfare of a subject. A SR device must follow all of the IDE Regulations at 21 CFR 812 and the study must be conducted under an Investigational Device Exemption (IDE) application approved by the FDA before the investigation begins. At the time of its review the IRB must review the investigator/sponsor's NSR determination and either agree or disagree. In addition, the IRB must review and approve the study using the FDA's Human Subjects Research Regulations and IRB regulations at 21 CFR 50 and 56. FDA Decisions for Investigational Device Exemption Clinical Investigations.